Hurricanes & Florida Property Management - Advanced Management Inc. The Atlantic hurricane season has reached its peak, and as of the writing of this blog post, the National Hurricane Center has issued advisories for Hurricane Gaston and Tropical Storm Hermine. While the eventual impact of these storms is yet to be determined, now is a good time to make sure your emergency response plans are in place. Property management companies do a lot more than keeping up with day-to-day maintenance and collecting payments. 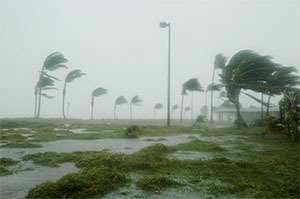 In Florida, they play a vital role in storm preparedness and in helping protect property and more importantly, residents. As a Florida property manager, here are just a few things you’ll need to remember. Fuel up vehicles in case a power outage makes it impossible to get gas. Post storm updates on social media and, if possible, send out text messages to keep tenants updated on the current situation. Back up all computer files off site or using a cloud storage application. Store or tie up pool furniture, maintenance equipment, trash cans and anything else that could become airborne debris in high winds. Replace batteries, fuel up generators, etc. Turn off gas and electricity to all units. Distribute information regarding evacuation routes, shelters, etc. to tenants. Check on elderly and infirm individuals to ensure that they are able to evacuate safely and request assistance from emergency services and/or emergency contacts as needed. Display signage with contact information on the leasing office door. Record an emergency message on the property’s maintenance and leasing office voicemails. Once it’s safe to return, the property manager will inspect as much of the property as possible and check in with tenants to collect reports of storm damage. He or she will then work with insurance companies, contractors, etc. to ensure that all damage is properly and expediently repaired. Florida’s weather is unpredictable, and preparing for major storms and dealing with the aftermath is a major challenge for condominium and homeowner associations. Self-run boards and associations struggle to ensure that all of the proper steps are met and tenants are kept safe. Working with a professional property management company allows your association to weather the storm with minimal worry. For the best property management in Florida, count on AMI of Southwest Florida. Our Florida property managers have decades of combined experience, and they’re devoted to meeting the unique needs of associations in Florida. To learn more about how we can help with emergency and hurricane preparedness, contact us today!